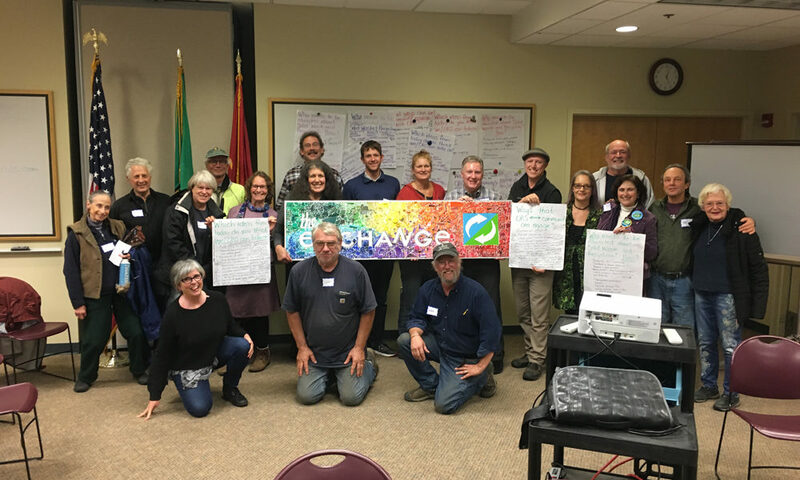 On November 3rd more than 30 committed folks joined ORS/The Exchange in a community forum to visualize the future of the solid waste management here on Orcas, and for all of San Juan County. Conversations covered the current system, improvements presently on the drawing board, as well as longer-term strategies. The event was led by a panel of experts who work in the field locally, and on a state level. The event was kicked off by Pete Moe, executive director of ORS/The Exchange. He discussed what has been happening at the Orcas Transfer Station, and where ORS plans to go in the near future with increased separation of recyclables. Mark Herrenkohl, solid waste manager for San Juan County talked about the unique nature of the county-wide system, and SJC’s plans for the future including a new Sutton Road facility on San Juan Island that could include separation of recycling, collection of household hazardous waste, and composting. Paul Andersson, director of the Lopez Solid Waste District described the incredible programs on Lopez, including a comprehensive separation system, off-site composting and disposal of glass, and the legendary “take it or leave it” reuse facility. He also discussed challenges, particularly in finding a home for baled plastic material. Heather Trim, Executive Director of Zero Waste Washington gave a great presentation on the current challenges facing the recycling industry locally and nationally. She also described the opportunities for making policy improvements in the Washington State Legislature, thanks to a new democratic majority. Community members then joined the experts and ORS board members in break-out groups where they came up with their own ideas on how to improve the reduce/reuse/recycle vision. Critical to all of this is the need for volunteers to get involved in policy, boot-on-the-ground, events, education and more. ORS/The Exchange has an easy-to-use online volunteer sign-up sheet that lets you sign up for just the type of jobs you are best suited for, check it out here. ORS/The Exchange also has a great monthly online newsletter that will keep you up to date. You can sign up for that at the bottom of our homepage, here (scroll to the bottom).